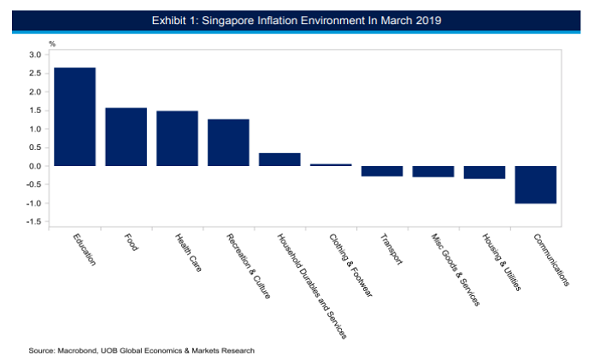 Singapore averted a technical recession in 3Q15, after final estimates surprisingly showed the economy expanding by 1.9% QoQ. Expansions in services and domestic demand offset the continued declines in manufacturing and net exports amid easing construction sector. Here are charts provided by MayBank KimEng to better understand the results announced last Monday. Real GDP growth was +1.9% YoY and +1.9% QoQ SAAR in 3Q 2015, better than the advanced estimate of +1.4% YoY and +0.1% QoQ SAAR (2Q 2015: +2.0% YoY; -2.6% QoQ SAAR). For the first three quarters of 2015, the economy grew +2.2% YoY (JanSep 2014: +3.2% YoY), driven by the services sector but dragged by the sluggish manufacturing sector. Manufacturing shrank further by -6.2% YoY and -4.6% QoQ SAAR (2Q 2015: -4.8% YoY;-17.3% QoQ SAAR), mainly on lower transport engineering, electronics and precision engineering output. Net external demand contracted -11.2% YoY and -59.6% QoQ SAAR decline (2Q 2015: +10.3% YoY; -54.9% QoQ SAAR) as growth in imports outpaced exports during the quarter.